Back Row, L-R= Tom, Mertz Ruben, Russell Bond. 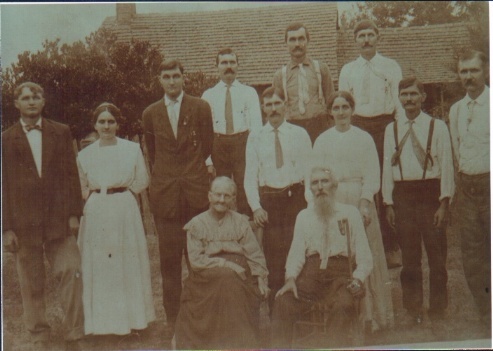 Center Row, L-R= Hardy, Emma, WP(Bill), Jessie, Annie, Seth, John Bond. Front Row, L-R= MARIA and MARION BOND. 7.MARION BOND was born June 01, 1837, and died September 25, 1926 buried in Hatten Cem Stone Co MS. He married MARIA CRAWFORD. She was born July 09, 1844, and died June 05, 1915 in Bur in Hatten Cem Stone Co MS.
i. NANCY MISSOURI BOND, b. May 18, 1860; d. Oct 09, 1875, Bur in Hatten Cem Stone Co Ms.
iii. SETH H. BOND, b. Dec 24, 1865; d. June 22, 1924, married, SARAH JOHNSON. iv. MERTZ RUBIN E. BOND, known as, (MERT RUBE )b. 1868; d. 1930, married, RONDA JOHNSON. v. RUSSELL D. BOND, b. Feb 14, 1868, d. July 08, 1957; m. MARY TAYLOR. vi. THOS. L. BOND, known as b. 1870; m. LILY BRELAND. vii.ANNA M. BOND, b. 1873. married,JOHN SMITH. viii. LOUIS (LEWIS) CLAYBORN BOND, b. June 19, 1875; d. Sep 23, 1886, Bur in Hatten Cem Stone Co MS.
ix. JESSE HESAKIAH BOND, b. June 20, 1877, d. 1935. married, MARY DICEY WILLIAMS. x. ELLA M. BOND, b. 1879; m. THOMAS BOND. xi. FRANCIS E BOND, b. 1881; m. CASKER HATTEN. xii. WM. P. BOND, b. 1883; m. EMILY SINCLAIR. xiii. HARDY FAIR BOND, b. April 29, 1888, d. Jan 15, 1923, m. LAURA WEATHERFORD.